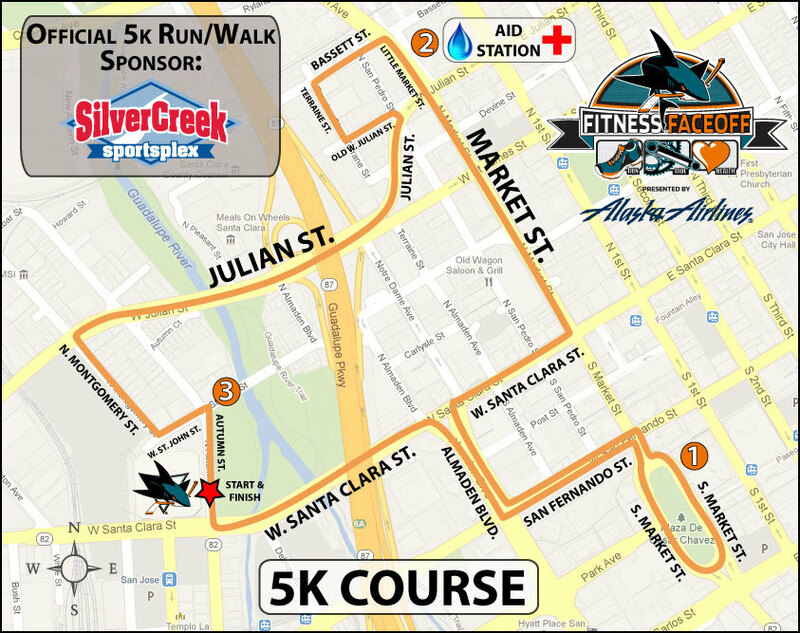 On Sunday, instead of the usual gym class we attended the 2nd San Jose Sharks Fitness Faceoff run that raises money for the Sharks Foundation. The race was in San Jose, it though it was the second one of its kind, it was the first for us. My husband is a huge hockey fan and our son has also been taking skating/ore-hockey classes at the Sharks Ice at Fremont since February, so this run seems like a natural for us to attend as a family. The race is quite a big one, as it included a 5k, 10k, kids run, 20 mile bike ride, 50 mile bike ride. 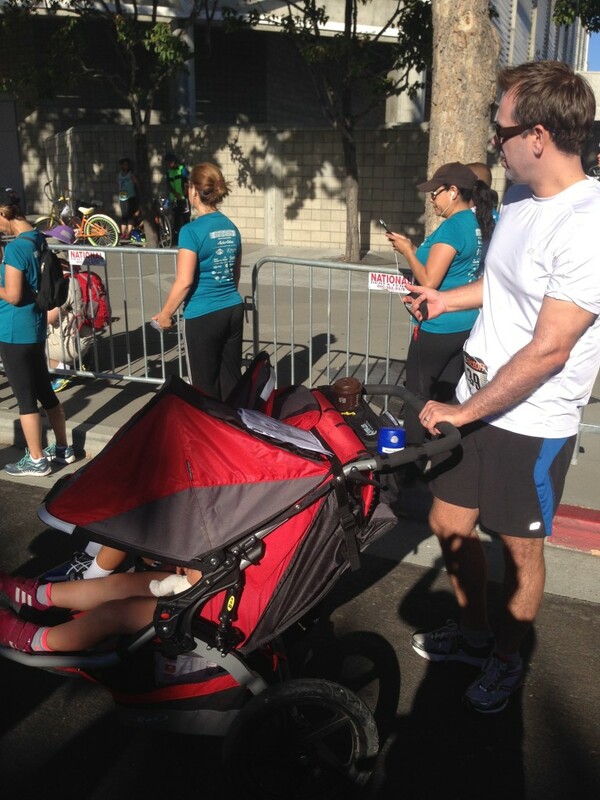 We chose to do the 5k together as a family, and since Roger’s been bugging me, we also entered him into a kid’s race. Since I am expecting it to be a big race, I decided to dragging my two kids along to the packet pickup at the Silver Creek Sportsplex on Friday. This gave me an opportunity to experience traffic to San Jose and back. Since the packet pickup was from 4-8pm (and the kids have soccer at 5:30pm), I drove 43 minutes to the pickup and 40 minute back (thanks to the 880 carpool lane!) and got back with 10 minutes to spare before Tot Soccer class. The night before, we made sure that we checked the BOB Dualie stroller for issues, pumped up the tires (which we have not done since the Coyote Hills run), and got our clothes ready to go. I programmed our coffeemaker to go off an hour before the absolute latest time we had to leave home. When we woke up in the morning, especially on days of runs that involve the whole family, we never feel like we are pumped and ready. We also hustled along thinking we would likely be late to the race! (What if someone pooped and needs changing? What if we forget something? What if the kids don’t cooperate? What if we caught traffic or got lost?) We actually stopped by McDonalds to get breakfast so we can save some time, make sure that the kids are fed and not hungry for snacks (though we did bring some), and get a portable cup of coffee for the stroller. James hasn’t had as much opportunity to work out the past two weeks and I can tell he needed that extra cup! After we ran the race, we enjoyed the nice festivities with all the booths. This is clearly a family friendly event as they had it setup near a nice playground, plus there were bouncy houses and a rock climbing wall. 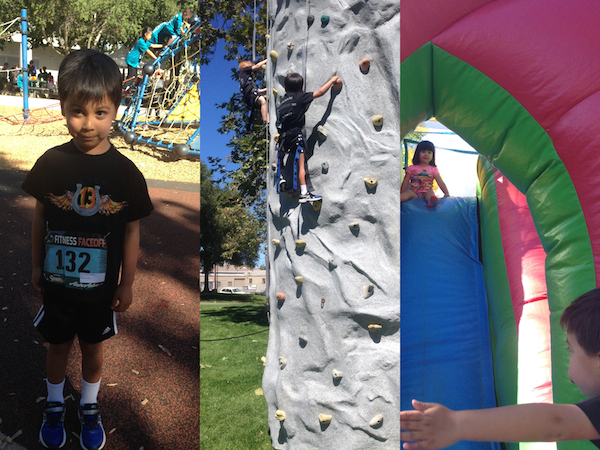 playground, rock climbing, and bouncy obstacle course and slide! The kids race started at 10:30, and it was definitely the highlight of our day to have Roger run his first major race, where he has a bib and a finishing medal (the kids run cost $35 but we got a nice tech shirt for the boy as well). This was the longest he’s ever run, at 0.5K, and we even got him a nice pair of new ASICS for the occasion since the Adidas he’s been wearing has been hurting his feet. 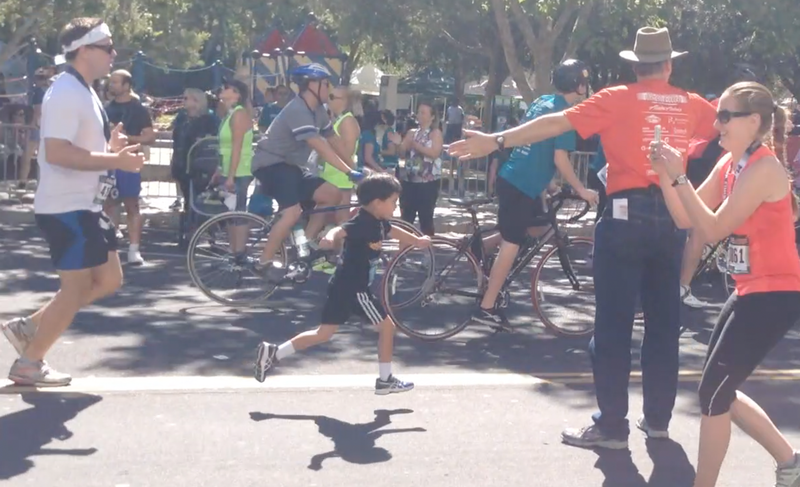 Roger runs forward toward the finish line ahead with Daddy right behind. We will definitely be back for another race next year to support Sharks Foundation — the race was very well-organized, well-supported, and lots of fun!